In a previous article I presented an addon to generate a floor board with individual planks. Each individual plank was adorned with a random vertex color that can be used to create materials with random color variations for each face. When working with the Ivy Generator recently I wanted this same feature and indeed my own space tree addon could benefit from this as well, because just like IvyGen it generates a single mesh object with a face. for each leaf. So I decided to separate this functionality from the floor board generator so it can be used in different situations. It will replace the vertex colors of the active vertex color layer with colors that are random but equal for each face. 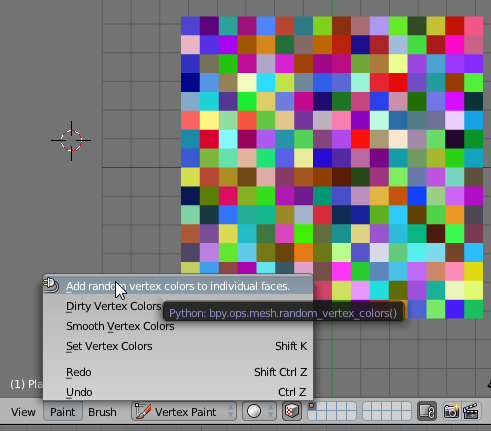 In Cycles vertex colors can be accessed with an attribute node, an example node setup can be found in the article on the floor board generator referred to at the start of this article. The simple code shown in this article is available for download at GitHub and is uploaded to the upload section of Blender extensions tracker so if you find bugs you may post them there as well. [2016 Feb 7] The version currently in GitHub is much faster for large meshes because it uses Numpy. Check this article to see why.